Vail / Beaver Creek is an area that offers vacationers a truly exotic winter paradise. Needless to say, the vast snowy expanses offer some of the most panoramic views you will ever see, but we at Colorado Mountain Activities, go a bit further to help you plan your next vacation or corporate event. If you have never tried dog sledding in Vail-Beaver Creek area, we have the most reliable outfitters who are going to make it possible for you to experience this adrenaline rushing activity. 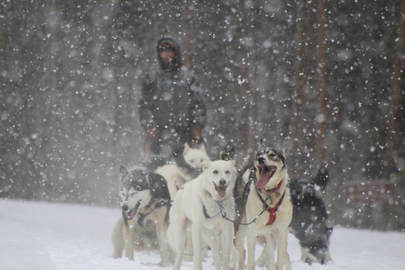 Dog sledding in the Vail-Beaver Creek area is famed all over the world because of the opportunity it gives people to enjoy the best of the mountains in serene surroundings. The beautiful huskies are fun companions when you are traversing the mountains. They add sledding with a whole different element. With our outfitters, you can enjoy mushing your own dog sled team through the scenic valleys in Vail-Beaver Creek's High County area. We choose our outfitters with attention to the value for money they offer, overall customer service, and pricing and we are proud to say that we have the very best for you to choose from. At Colorado Mountain Activities, we always strive at making sure that visitors enjoy their vacations a lot more. And when Vail / Beaver Creek has so many different activities to offer, and then why not enjoy it to the fullest? Our outfitters make your holiday vacation or corporate event a lot more special by giving you the opportunity to book a dog sledding adventure in Vail / Beaver Creek right from your home. Make the most of the fun activities we have to offer today and enjoy your vacation in the mountains like never before! The tour begins when you are greeted at your hotel by a friendly guide and begin the journey into the beautiful snowcapped peaks.